Sidewalk Envy: Summer...Who's Your Granddaddy? Last night we were watching PBS. Dr. Henry Louis Gates was hosting a genealogy show, the one where celebrities get to find out that they are descended from other celebrities. I find these shows interesting from the standpoint that people who could well afford to hire genealogists, and pay to travel to far-away places to search out ancestors, are seemingly treated to all of that information. The thing is, they don't do it themselves. It's not personal, they aren't doing the work and collecting the stories. They hire someone to do it for them. I think being a part of seeking out and finding the information makes it all the more exciting. In this edition, along with making these connections they were talking to their subjects about gene mapping and how one could, by giving a DNA sample, find out where their lineage came from, as in Asia, Africa, Europe, etc. One hails from Europe, another from Asia, some have lines that take them through those areas, but go back further to Africa, some Native Americans, some a combination...it's all very interesting and something that any one of us, I think, would like to know. Until I hit the lottery and have the funds to hire someone to trace our family tree back to Charlemagne or someone else, or have DNA testing done, I have some knowledge through family stories and many years of sending off for this record and that record, that our lineage is Irish, English and German, and I do know for a fact that our family lines take us back to Ilion, Schenectady, Glenville, and Rosendale, New York and to Scranton and Honesdale, Pennsylvania. Okay, it's only the middle and late 1800's, but it's a start. Meanwhile, I should point out that I am a professionally paid genealogist. My grandmother once gave me a dime to find my grandfather. At about age 9, I was sent to town to find him and, yes just like in the movies, ask him to come home. She had a pretty good idea what bar to find him in and I barely made it in the door when he spotted me. I didn't have to say a word. He spied me and said, "Get out of here. I'll be home when I'm good and ready to." Okay, he swore a bit, but he was my grandfather, and I knew when to beat it. I only reported to my grandmother that I found him and that he'd be home...didn't tell her when. The genealogy I remember from my childhood had nothing to do with DNA, but more to do with stories like that and the antics of our very own dysfunctional groups. Laughter from the shore when older cousins sent us out in a leaky boat with an uncle of ours who was taking us fishing, being chased around the kitchen by a great-aunt with a butcher knife when we got too close to the watermelon (having heard that my mother jammed a pencil in her brother's leg one day when she didn't like something he said, and leaving the lead there for a lifetime, gave me cause to worry), being tipped over in an outhouse by an older cousin who thought the experience was something everyone should have, and hearing that a great-aunt was catapulted out of her casket by her overly grieving sisters in the middle of the funeral home were some of the 'normal' events. I think I would like to know that we were descended from Celtic Kings, but they didn't teach me the fine art of steaming open letters like my grandmother did. Having a famous actor or politician in your past might be a great conversation starter, but so does telling people how your grandfather showed you how to roll cigarettes when you were eight (he needed help as he must have smoked about three or four packs a day). Genealogy study is interesting, and I continue to search out the past. 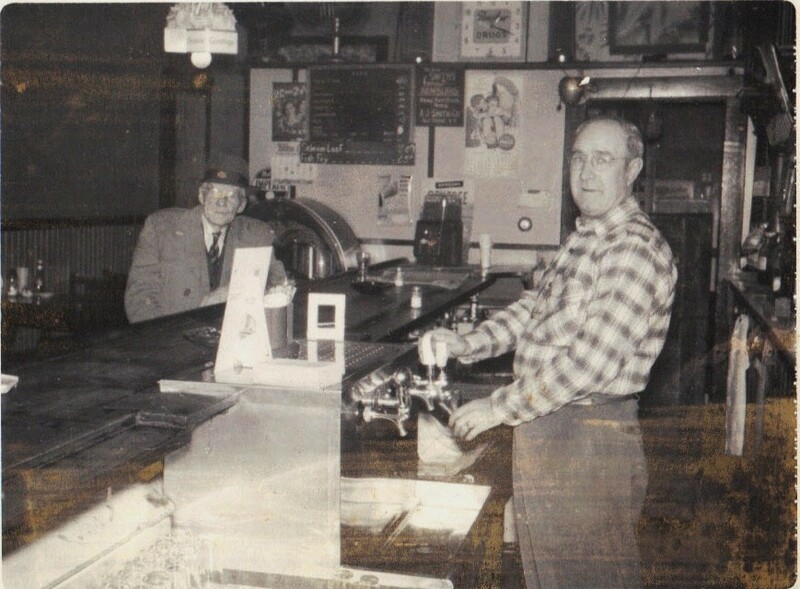 In fact, today I came across this picture of my grandfather at one of his favorite watering holes. 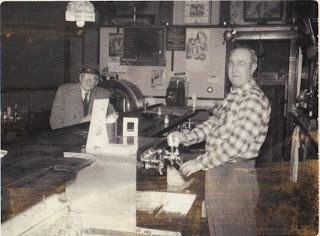 Don't know the name of the place, or the bartender, but that's himself, "Sweeney," as everyone knew him, in top coat and fedora (we always dressed to go to town), almost as I remember him that day I did my first bit of genealogical research. I knew who my grandfather was, I knew where he was, and I have the personal story to go with the person and the event. Everything a genealogist could hope for. And my grandmother knew where he was and where to send me, too, 'cause she probably was listening on the party-line when someone said, "I'm meeting Sweeney in town for a drink." DNA is great, and there are certainly records to prove to others that he lived, but there's nothing like personal research!